About door closers, compliance and regulations. There are different strengths of door closer – how do I know which one to choose? How do I overcome air pressures with door closers? Which factors do I need to consider when choosing door closers? Do I need PAS 24 on my door closer? There are different installation applications – what are the options? I don’t want my door closer to be visible – is this possible? What is British Standard BS 8300:2009+A1:2010? What does EN stand for? What do I do if I want to return some products? The width of your door should be your primary consideration when determining which power size to choose. See the table below for details. Understanding air pressures and door controls can be a challenge on some doorways and we have summarised this to help influence and choose the right door control. Fit the room with a air grill or fire grill damper. We trust these are useful and if you require any further help do not hesitate to contact ourselves. Door width: also consider the height if it is more than 2.1 metres. Door thickness: this is especially important for concealed closers. Are the door and frame fire rated: what fire rating does it require – 30-, 60- or 120-minute? On which side of the door will the closer be installed, the push or pull? Who is using the door, for example children, general public, less-abled people, office or warehouse operatives. Does it need to comply with The Equality Act, BS 8300 (DDA)? Do you need back check or delayed action? It is a misconception that a door closer, a hinge, a lock or any part of a door or window hardware can be individually graded or claim as PAS 24. It is very important that the whole doorset or window system is tested as a complete unit in order to gain the PAS 24 accreditation. Here are the 6 installation options for a door closer. Delayed action prolongs closing time, for example to make it easier for wheelchairs or less abled people to pass through the door easily. Yes, this is possible by choosing one of our concealed products such as the ITS.11003, ITS.11204, ITS.11205, TS.8003, TS.7003, TS.7004, TS.7104, TS.7306, ETS.7004, all dependent on the type of fire door or door structure required. Softclose® is a registered trade mark that is on the TS 9205 door closer. With the high efficiency and stability of control on this closer you can adjust it so that it closers with great ease and protects little fingers. The door closer will close on the latch with out any noise or vibration. Ideal for Hotels, Restaurants, Schools, Public libraries, Universities and many other situations in the differing building sectors. On the highly efficient Cam Action door closer they have been designed with safety and security in mind. Used in many and varied applications with the need to protect little fingers, this Door Closer has an integrated Powerlatch® which controls the last 15deg of closing. This gives time for a person or persons fingers to be removed before any possible damage is done. The Equality Act 2010 (formerly The Disability Discrimination Act 1995, or The DDA for short) is human rights legislation that imposes a duty on employers (under Part ll) and people or organisations that provide a service to the public (under Part lll) not to discriminate on grounds of disability. For education buildings, the Special Educational Needs and Disability Act 2001 (SENDA) imposes a similar duty on establishments providing educational services. A building or a design solution cannot be The Equality Act 2010 compliant. It can only be designed or built in a way that helps people meet their duties in the Act and, therefore, minimises the risk of a legal challenge. For many existing buildings, it will be necessary to make ‘reasonable adjustments’ to certain ‘physical features’, e.g. to widen a doorway or to modify a staircase, where it would otherwise be impossible or unreasonably difficult to accommodate a disabled person. Since any alterations to a building need to comply with building regulations, the guidance in Approved Document M, Section 4 of the Scottish Technical Handbook and Part R of the Northern Ireland regulations should be the first reference point for suitable design solutions. However, for issues not covered in the regulations, the recommendations in the most recent edition of BS 8300 should be followed. You can read the UK Government’s full guidance on The Equality Act here. It’s the standard that covers the design of buildings and the approach to meeting the needs of people with disabilities. It’s widely used as a reference document for guidance on issues not specifically covered in building regulations. Based on ergonomic research, BS 8300 includes reach ranges, space allowance, management issues and colours, contrast, lighting and acoustics. Contact us to discuss your obligations and requirements with regard to BS 8300. EN 1634-1:2008 covers fire resistance and smoke control tests for door, shutter, and openable window assemblies, as well as elements of building hardware. EN 1154:1997 covers building hardware, specifically controlled door closing devices and the associated requirements and test methods. 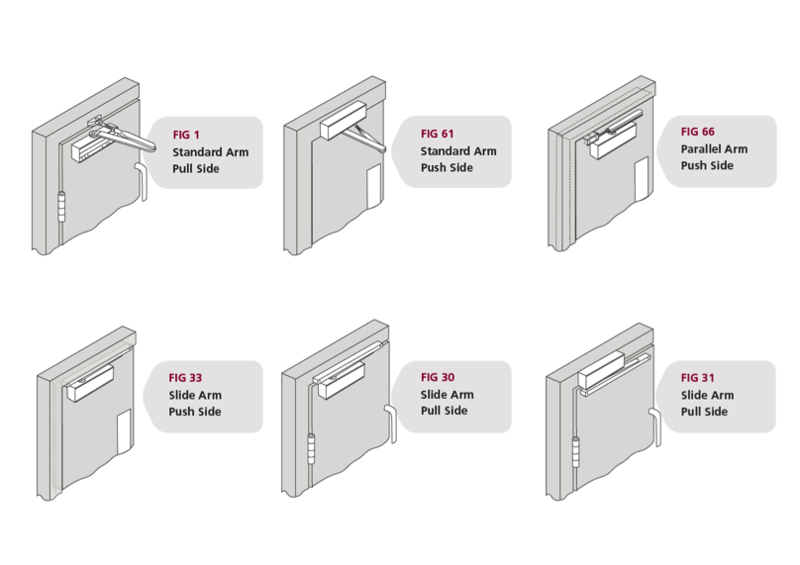 It specifies requirements for controlled door closing devices for swing doors – whether these devices are mounted on or in the frame, on or in the door, or in the floor. EN 1155:1997 covers building hardware, specifically electrically powered hold-open devices for swing doors and the associated requirements and test methods. We offer same-day despatch for UK mainland delivery addresses for orders placed before 2:30pm. For Ireland and EU we offer next-day despatch. Global delivery is negotiated based on your requirements and project location. Collect a returns note from Rutland with the agreed credit if applicable – subject to inspection on return. Pack product securely and Label with Rutland address. Agree a date and time for Rutland to collect. Please remember that goods will be credited if returned in a re-saleable condition and in perfect working order. Goods returned after 3 months may not be credited. Just ask. Our team is standing by to discuss anything from ordering and delivery through to engineering, compliance and fitting.